I find it irresistible to pass up food packaged in something cute like a reusable jar or bottle. Last week it was Starbucks frappuccinos at the grocery store. I don't even drink that stuff but it was on sale and they came in little milk bottles so I was sold (I got mocha flavor and it wasn't too bad, plus all the labels came off really easy). 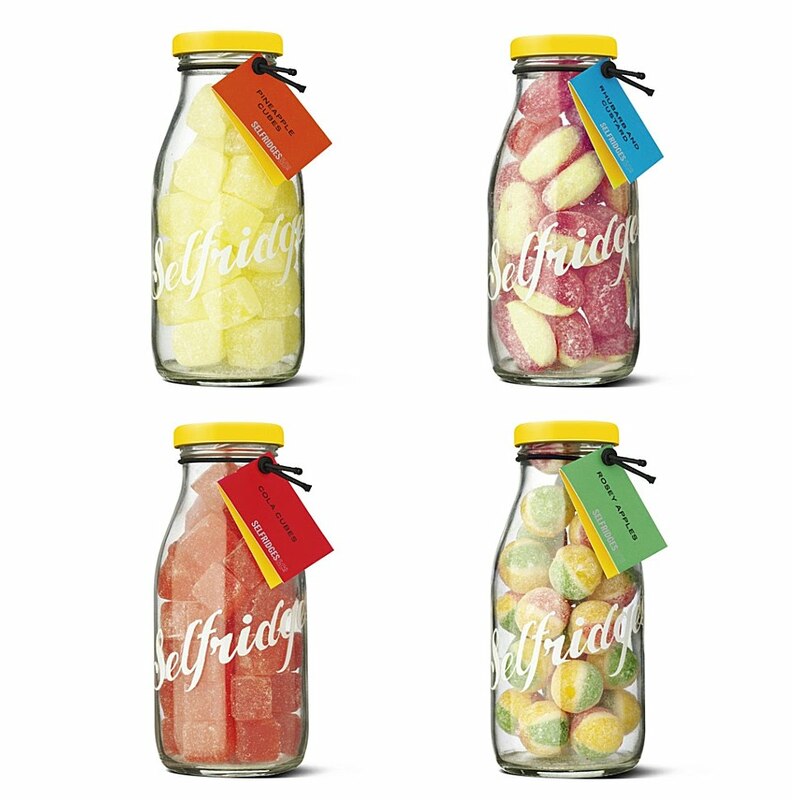 These sweets above are from Selfridges&Co and come packaged in retro glass bottles. I think they would be great for gifts or parties, they are so nostalgic and sweet. Would love to try one of the pineapple cubes right now! Cute! I've never heard of this company - I'll have to check them out! Ooh, I loved pineapple cubes. And custard and creams. I wonder if my mom will mail me some (I'm originally from the UK). Ha! I'm such a sucker for packaging... this would make such a sweet gift! Every bride has their own color, and some dynamic, some dazzling colorful, full of love ... ... and some colors are the future of each symbol, depicting the bride's future. Thanks for your sharing! I am pleased to share my joy with you? If you like the Starbucks lattes, have you tried the ones from Adina? http://www.adinaworld.com/ They're made with organic coffee, milk, etc. and are reeeeeallllyy good. Those are so cute! I love the packaging. too cute! Yes, I too, I have been know to buy products solely because of their packaging! Presentation is key!